Last week I managed to read a whole book, granted it was a fairly short one. 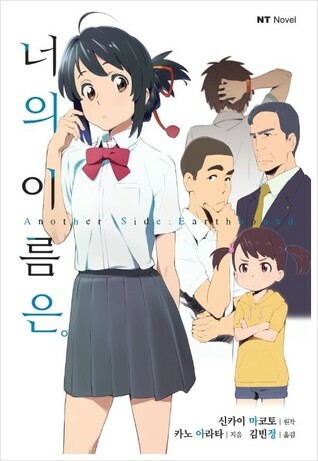 I read Your Name: Another Side Earthbound. I really enjoyed this book that helped to add a new level to the story of Your Name. I’ll be posting a full review of this book in the new year. As we continue to watch a different Christmas movie every day, we are giving our TV plenty of attention. This week we watched Jingle All The Way 2, The Claymation Christmas Celebration, I’ll Be Home For Christmas, Phineas & Ferb: A Very Perry Christmas, How The Grinch Stole Christmas, I Want A Dog For Christmas Charlie Brown and A Charlie Brown Christmas. The boy and I also watched Your Name again, because we love this movie and had a strong desire to watch it on the weekend. I did also watch a couple of episodes of The Incredible Dr. Pol as well. Last week was one of those weeks where it felt like I was doing nothing, but looking back on it, I did quite a bit. I got most of my Christmas baking done over the course of several days. I cleaned out and reorganized our freezer. I also reorganized part of our laundry room, and now there is lots of free space in it. I spent several hours one day working on various posts for the blog, since I have been slacking on keeping up with those lately. Of course I played plenty of World of Warcraft as well. I’m not sure what I will be reading this week. I have a small stack of books I’m hoping to get through either this week or before the end of the year, so I will likely be working on those. Well, one thing for certain, is that I will be watching Star Wars VIII: The Last Jedi this week. I’m sure excited to watch this movie. Otherwise, I don’t really have any solid plans for this. I need to finish up the last of the baking this week, which basically is down to baking and decorating gingerbread cookies. It’s supposed to be another super cold week, so I’ll be spending my time inside likely playing World of Warcraft for hours on end each day. Sounds like you have good plans for the week. I’m just watching The Voice. I haven’t seen a Christmas movie yet this year. Oh, and reading those 2018 releases filling my review stack. Come see my week here. Happy reading! Hoping our plans work out well, winter has a way of interrupting things where I live. Oh, 2018 releases, how fun. The Your Name book looks good. Come see what I’m reading. It was so good. I really love the story from Your Name. Have you seen the movie by chance? The Hunger games is the only thing keeping me reading, thank goodness I started it! I’m looking forward to The LAst Jedi as well, it’s finally almost here! Glad you are enjoying it. It’s been years since I read that one.